To those wondering whether writing Tamil letters or email requires any software download or installing extensions, don't worry. 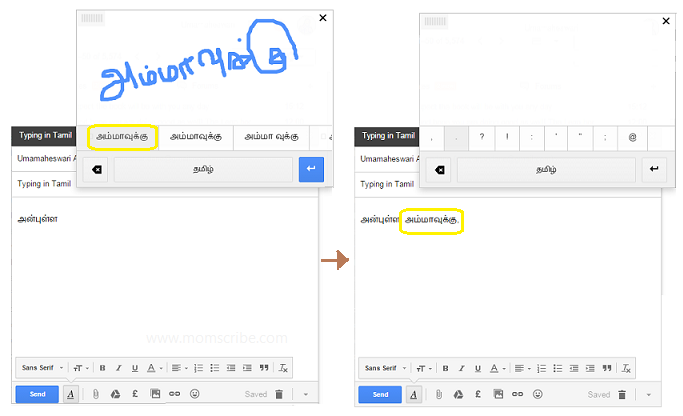 Writing letters in Tamil using technology is not difficult anymore especially if you are using Gmail. Using the following guidelines, you can send emails written in Tamil to your far and dear ones quickly and easily. Tamil phonetics nothing but Tamil transliteration and is an easier way if you are comfortable typing at great speed. Just type in the English letters from the keyboard just as you speak in Tamil and the letters will transcribe itself automatically. The only problem is that you will need to switch between the swift keys to get your Tamil grammatically correct. Example : "naan ingSHIFT(e) nalam" will get transcribed to "நான் இங்கே நலம்" using SHIFT key wherever needed. I find this one the most easiest way for writing Tamil especially when it comes to writing grammatically right. It reminds me of the Yahoo transliteration. 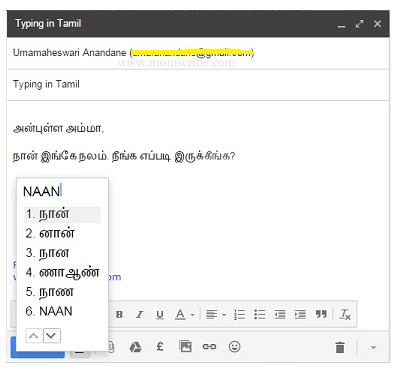 I would highly use this input tool for my Tamil writing in Gmail. I could not find a better name for this input tool. A slate is where I learnt to write my first Tamil word when I was young and now the same is replicated online to make Tamil writing easy. For this,there is no need type letters using keyboard and you don't even need to worry about the size or the shape. All you need is to draw your word on the slate and just click on the right word from the formed. Isn't writing email in Tamil fascinating and quite easy? Okay, but where do you find these input tools and how will you bring them into you Gmail. 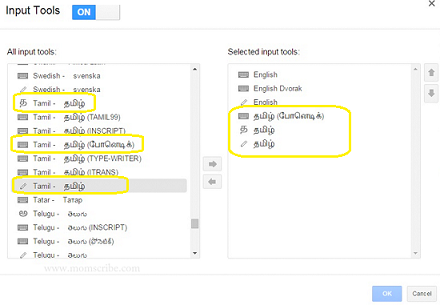 All the above three Tamil writing tools and more are readily available in your keyboard feature. For this click on the keyboard icon on the top right of your Gmail and select "Input Tool Settings". Then, select and drop the following three input tools from the right to the left box and click OK (see image below). Now finally, you can select your keyboard according to your needs as explained above. 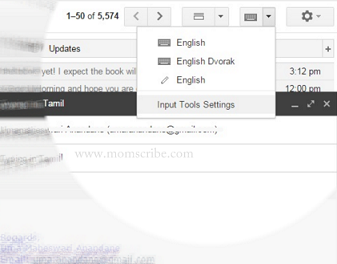 There are more Tamil input tools in Gmail but personally I found the three above the best. Similarly, you can write emails in Telugu, Malayalam, Hindi, French, German and more languages using the right input tools from Gmail. Happy writing and do comment below for any questions. Thanks for this information. This seems to be very easy. All these days I was using quillpad. Great help for those wanting to write in Tamil !